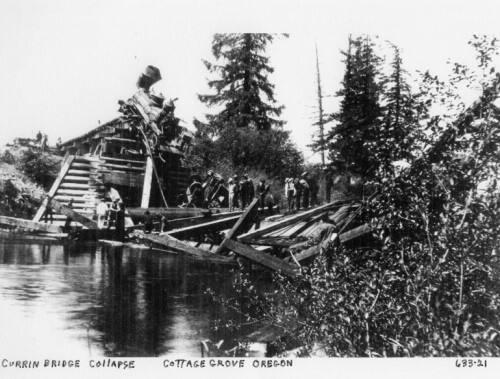 Back in 1909 there was a train wreck on the Currin Railroad Bridge next to the present day Dorena Grange. As you can see from the picture, the engine made it across the bridge before the collapse, but the passenger cars did not. 17 people were injured but fortunately there were no fatalities. Hi Katy, great picture! I wonder if anyone knows for whom the bridge was named. My Grandpa Kirk’s sister, Elsie, was married to George Currin. The football field was named after him.